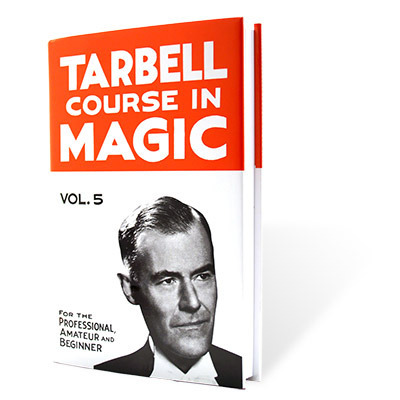 Today, when you order "Tarbell Course in Magic Volume 5 - Book", you'll instantly be emailed a Penguin Magic gift certificate. You can spend it on anything you like at Penguin, just like cash. Just complete your order as normal, and within seconds you'll get an email with your gift certificate. The most respected course in magic! The classic volumes cover every aspect and interest in the art of magic performance. A must have for every magic library! THIS VOLUME INCLUDES: Unique Magic, More Unique Mysteries, Four-Ace Effects, Modern Mental Mysteries, Hat and Coat Productions, Oriental Magic, Original Oriental Secrets, Tarbell Hindu Rope Mysteries, Modern Rope Magic, Magic of the Bambergs, Magic with Bowls and Liquids, Illusions, Publicity and Promotion. 13 lessons. 418 pages (hardbound). 1152 illustrations. I'll be honest...people told me about Tarbells and I saw them around for years before I ever picked up the series. This is one book series I really wish I would have listened to all the people who told me to get them earlier. This, besides perhaps a couple of key books (like "Royal Road" and "Expert Card Technique") are THE BEST books in magic that I think just about anyone even thinking remotely seriously about magic should own. The books are THAT good. I won't say they are the easiest books out there to read, and there are more than enough challenging effects contained within the books to keep you busy for YEARS if you want. The books can be a slight challenge at time for sure. I found books like "Now You See It, Now You Don't" and "Royal Road" to be a little bit easier to grasp as a beginner. That said, do NOT let that deter you. These books are prized gems, and should be in your library. In the day and age where everyone is into Instant Downloads and home video, it may be hard to purchase books to learn magic. If there are any books you should have and are thinking of getting it's first Royal Road to Card Magic and Card College. These would IMMEDIATELY follow those books. And if you are a seasoned magic vet and don't own these yet....ADD TO CART. 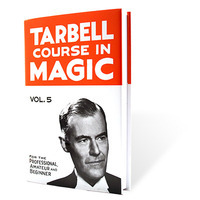 The Tarbell courses cover every aspect of magic and then some. If you need resources and a literal plethora of magical effects and handlings these are the books you need. Tarbell is a must have for your magic library. this is a great volume and will teach you numerous effects and more theory and psychology of magic includng many other effects using liquids and non stalk items. If you are serious about your magic and want unlimited resources this is a must have set of books. Add to cart and enjoy. Most of the DVDs and videos available today are based on the books collecting dust on people shelves. You will be able to gain an understanding of how true magic works by reading the works of the Masters.